On April 14, 2017, the Abyssinian Baptist Music Ministry will premiere American jazz great Cyrus Chestnut’s, The Saga of the Cross, featuring the United Voices of Abyssinian, the Cyrus Chestnut Trio, brass, percussion and the Hammond B3 organ. The Abyssinian community is excited to share this extraordinary event with you, and we know it will bless all who hear and bear witness to this musical testimony during the Lenten season. Please visit the direct link below to purchase tickets! 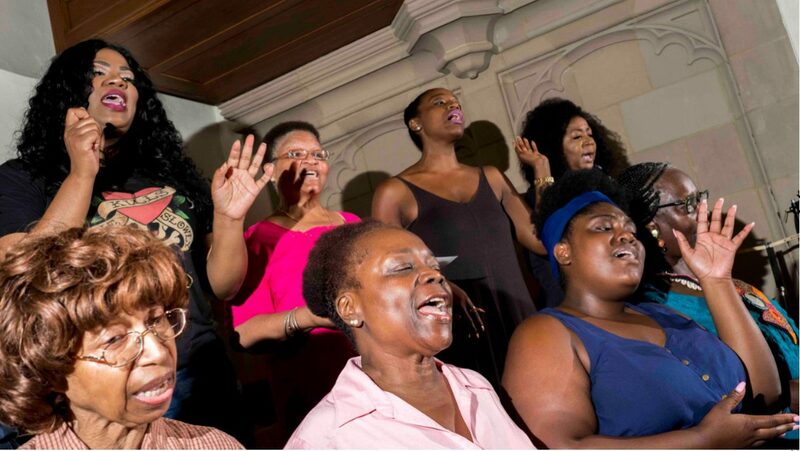 The Abyssinian Baptist Church Choir will present a free concert Friday, Oct. 21, at 7:30 p.m. in Woolsey Hall, 500 College St.
“Listen to the Lambs: Music from the African American Worship Experience” is the title of the event. Alumnus Nathaniel Gumbs M.M. ’11 will perform on the organ at the concert. The event is hosted by the Yale Institute of Sacred Music. There will be open seating, so guests are encouraged to arrive early. Abyssinian Baptist Church Choir featured in BBC segment. Abyssinian Baptist Church Choir is featured in this June 2016 BBC segment by Nick Bryant, remembering Muhammad Ali and his ties to Harlem.